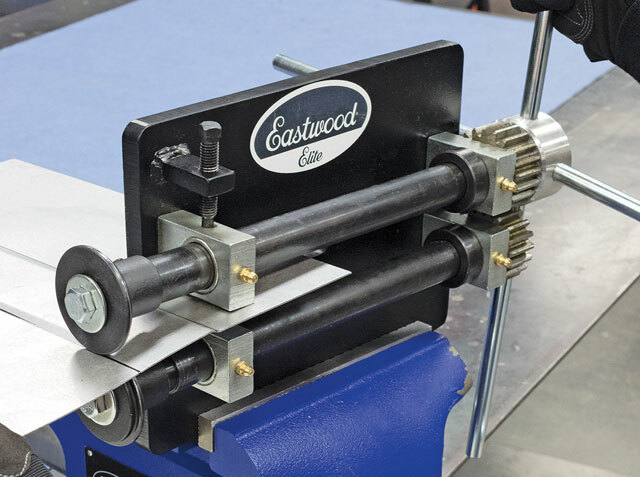 The Eastwood Elite 8-Inch Heavy-Duty Bead Roller is one of the only manual bead rollers on the market that enables you to produce strengthening ribs in panels, shape edges and form intricate designs in any panel by yourself. You can also create channels and flanges with the offset flange dies that are included. The gear-driven design delivers maximum forming power and leverage while requiring minimal handle force for the greatest accuracy. The 8-inch throat depth provides the ability to reach the center of a 16-inch panel, and you can add larger panels as well if you're creating curves towards the edges. With the 4-spoke crank handle and the smaller size of this heavy-duty bead roller, it only takes one person to easily operate and form panels. The unit attaches to a bench vise which holds it fast as you work. And it is still big enough to make small floor pans and other commonly fabricated parts without any outside help needed. The roller can handle 20 gauge stainless steel, 18 gauge mild steel and 16 gauge aluminum, which covers what is used in most vintage and modern vehicle panels. This bead roller includes the popular 3/8-inch Bead Die Set and Offset Die Set that you will need in most of your fabricating projects. These are the two most common sets that are used for auto restoration and bodywork. With the industry-standard 22mm shafts you will be able to use most other die sets available like the optional Eastwood Bead Roller Metal Fabrication Forming Dies. Switching dies is simple and you can be confident they will make strong, reliable beads. The Elite 8-Inch Bead Roller may be the smallest of our heavy-duty rollers, but it packs incredible power and versatility into an affordable package. We've tested it extensively to make sure it does the job that home fabricators need it to do. The roller can also be used for making metal decorations and artwork when you're not working on your car. View our bead roller demonstration video below or call our experts toll-free if you need help getting started. 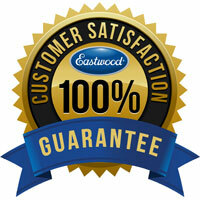 With our 100 percent customer satisfaction guarantee, you'll know you're getting a product you can trust. This tool has rotating rollers and gears with amplified leverage which can quickly cause severe injury! Keep fingers and hands away from moving parts when operating. Wear proper work glove and protective clothing and eye wear.